Hello! It’s Megan from Brassy Apple. 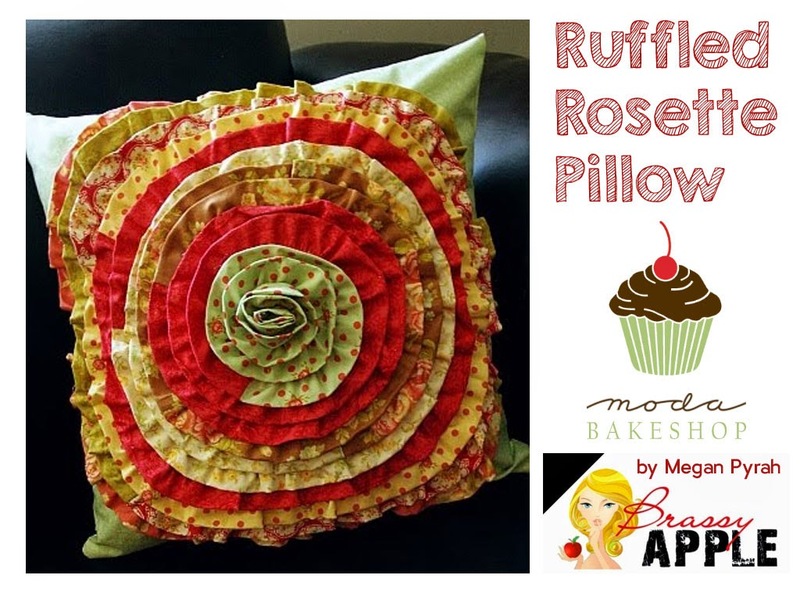 Add some texture and color to your pillows ANY season of the year with this fun Ruffled Rosette Pillow! 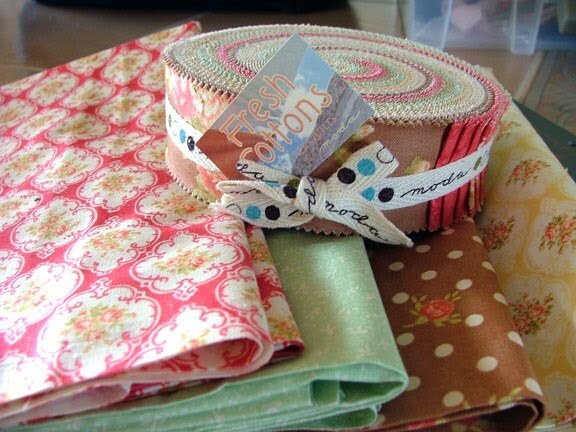 Step 2: Choose 10 jelly roll strips. 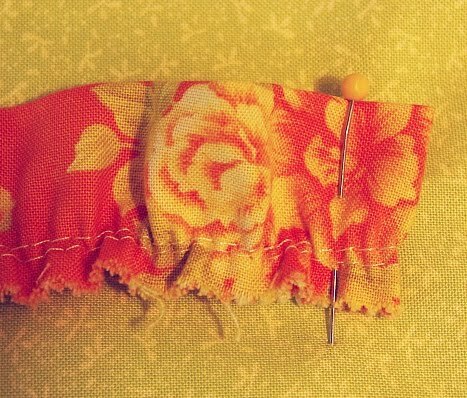 Step 3: Placing right sides together, sew together one of the ends. Open and lay flat. Place the 3rd strip on top of one strip right sides together and sew 1 end together. This will connect the three pieces together end to end. Repeat with all 10 strips. Step 4: Hand wind a bobbin with elastic thread. 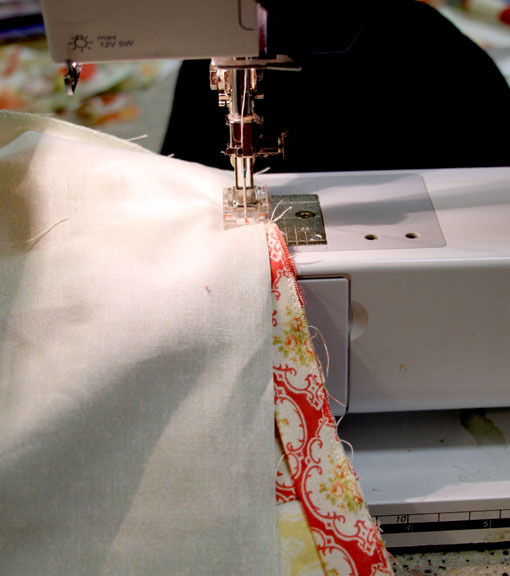 Adjust your sewing machine to it’s longest stitch length. 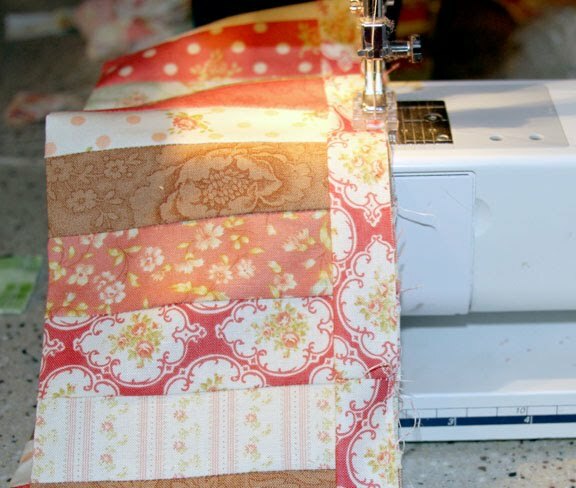 Fold the long fabric strip in half lengthwise, wrong sides together and sew down the length of the fabric. 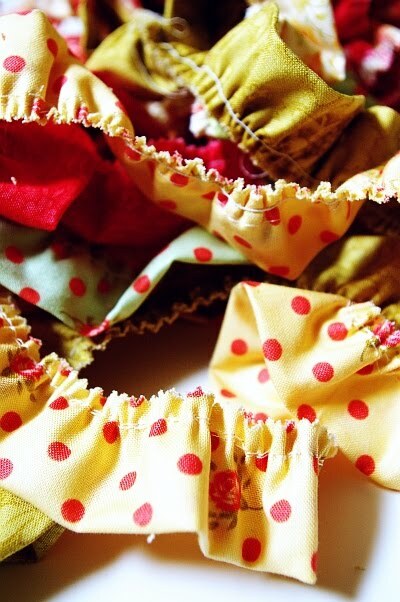 The elastic thread should gather and “pucker” the fabric creating an easy, “no fuss” ruffle! 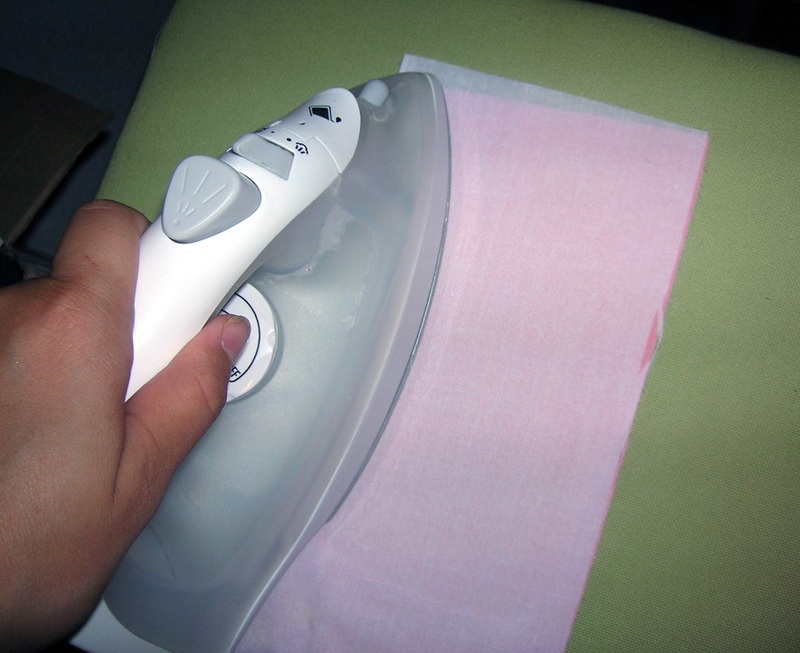 Use your iron on a steam setting to heat or shrink up the elastic thread and gathered fabric. The heat and steam will help it to bunch up a bit more. 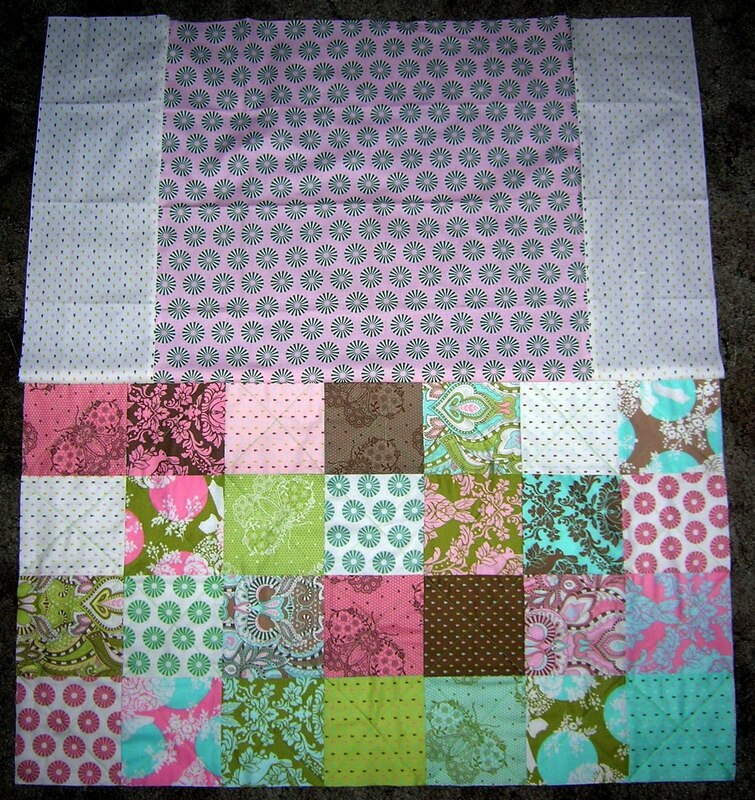 Step 5: Take one of the 17″ x 17″ squares and lay flat. Starting near the top in the middle, place one end of the ruffled strip. Fold the raw, unfinished edge under and pin. 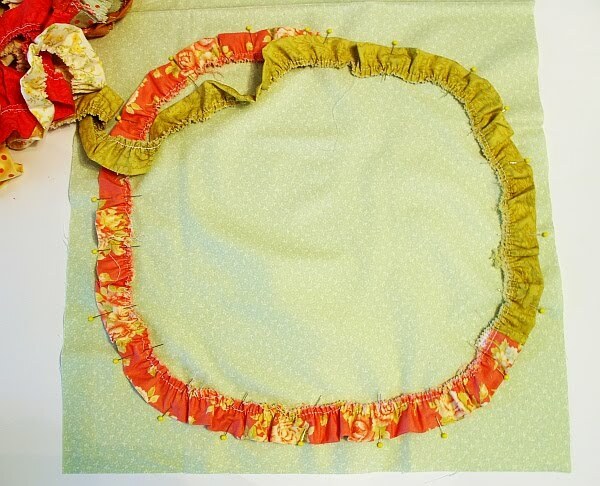 Step 6: Create a large circle with the ruffled strip pinning it into place. Keep in mind your seam allowance. 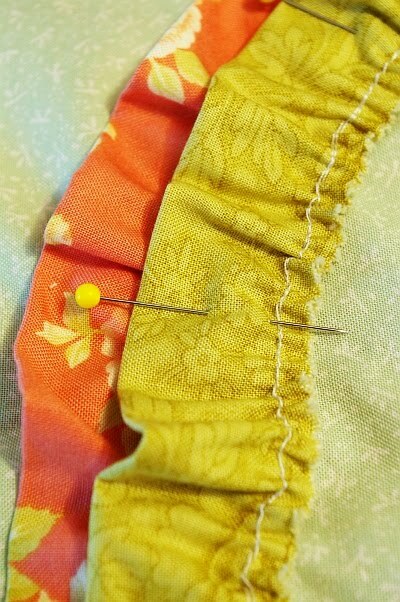 Step 7: Using a straight or zig zag stitch, sew the strip into place. Layout and pin a second circle slightly overlapping the inside edge of the first to cover the stitching line. Stitch into place again and repeat this step until reaching the center. 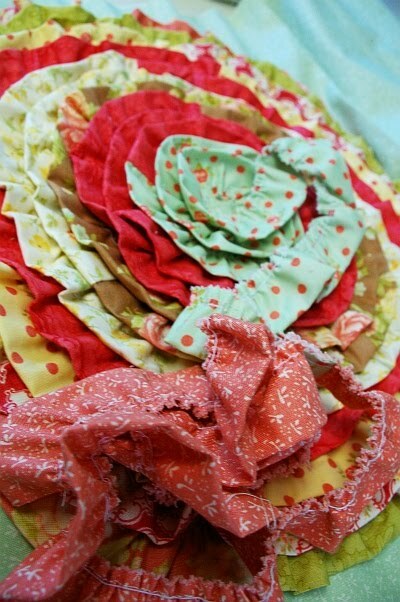 Step 8: Depending on how tightly your fabric bunched up and how closely you overlapped your circle layers, you may have a little bit of extra ruffles when you reach the center. Measure out a 3-5″ tail and cut off the excess. Step 9: Roll the end loosely toward the center. Position and pin the rolled rosette from the underside. 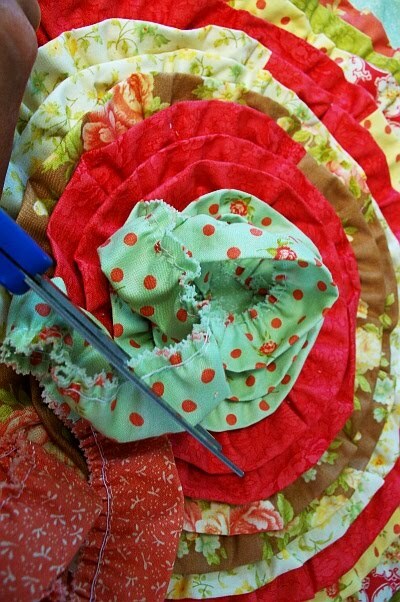 Hand stitch the rosette center into place. 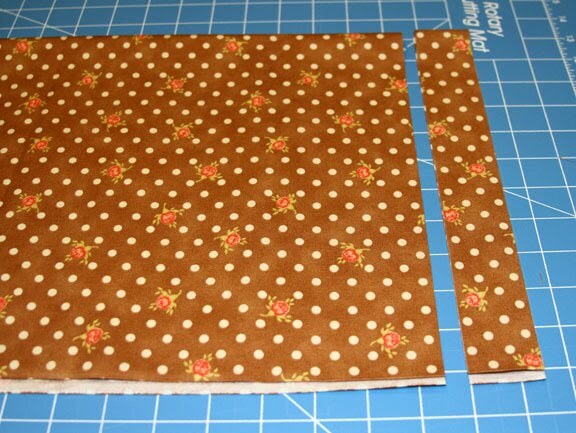 Step 10: Position the second 17″ x 17″ fabric piece on top or right sides together. 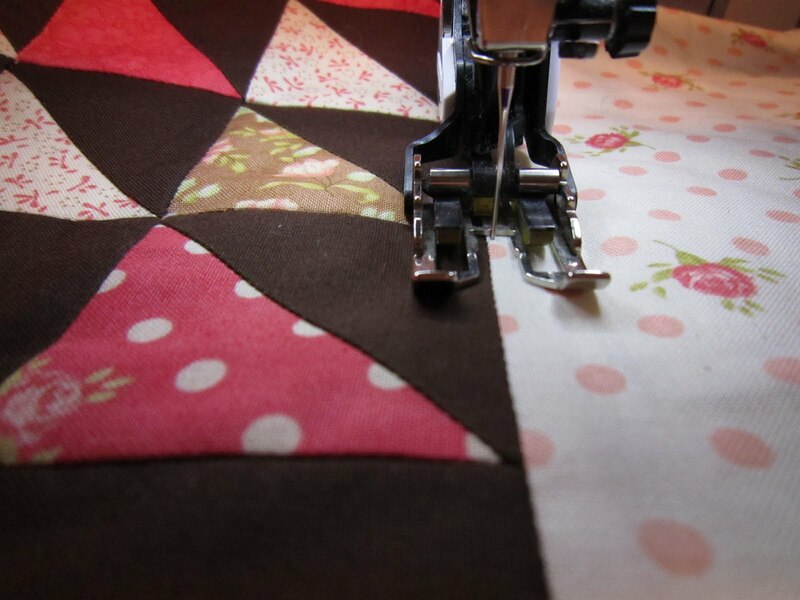 Sew all the sides together leaving a 6-8″ opening at the bottom of one side. Turn right side out and slip in the pillow form. 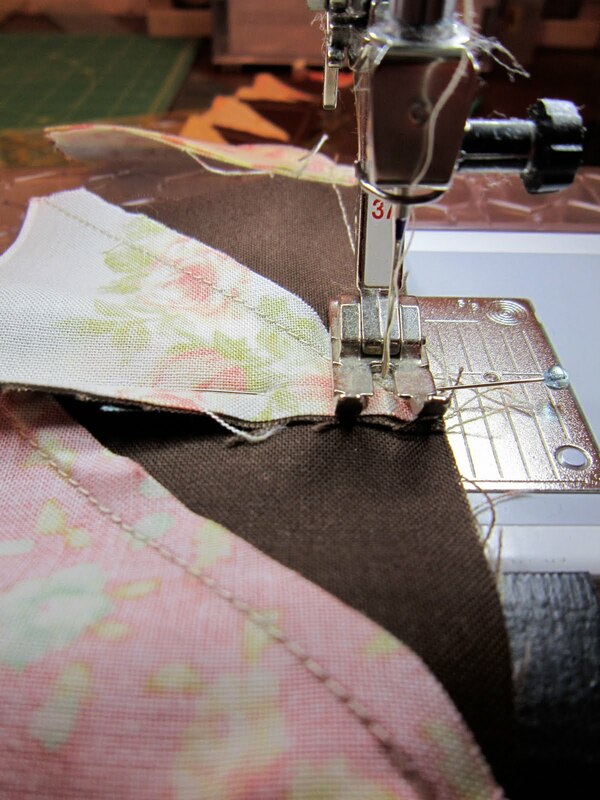 Hand stitch the opening closed and pop onto your couch or favorite chair! I fabulous pillow your friends will notice and love! Hello! 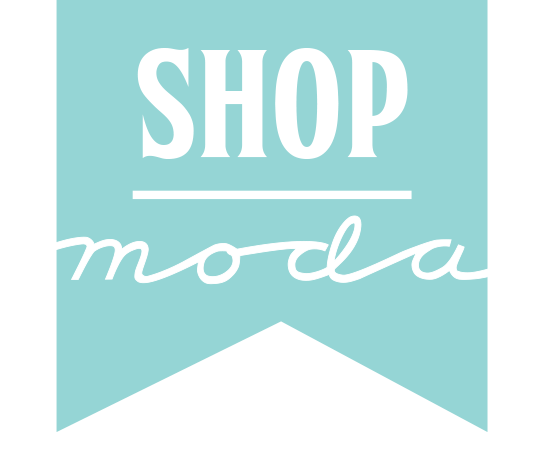 Back with another Moda Bake Shop project, and I hope you love it! Just in case you are getting a little scared by all of those triangles, don’t be…I’ve come up with the best fabric trick ever to make this quick and fun. The words ‘Sunday Best’ brings back so many memories of growing up in my mother’s home. Sunday Best referred to how we dressed for church, how we behaved, the meal we ate, how we spoke, and how we treated one another. Extra care was given, a little more time was taken to prepare. Sundays were special, and this was reflected in all that we did. 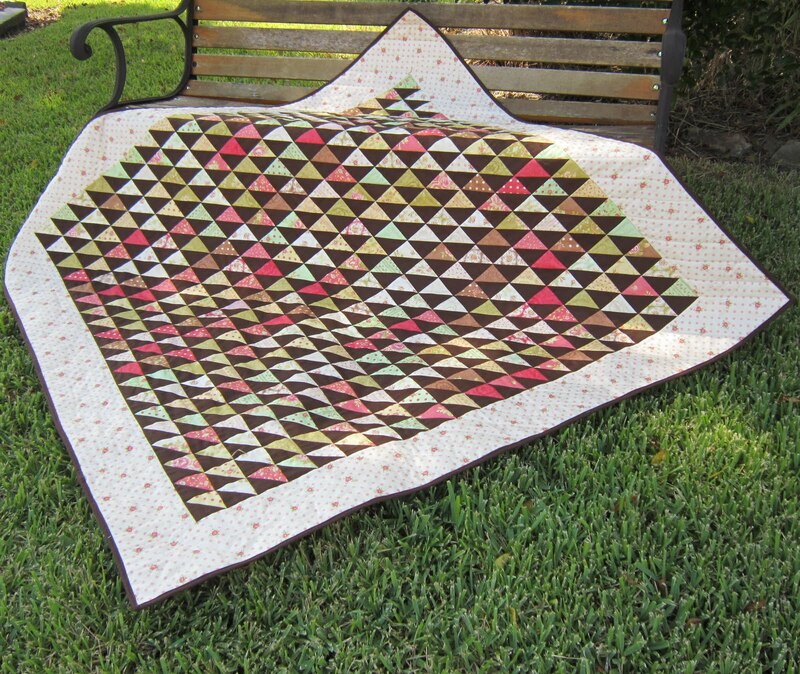 Sunday Best is the perfect name for this little quilt in my mind…beautiful, delicate fabric, lots of little triangles, and a little extra effort make this quilt something to treasure. 3. Open the folded square, refold in the opposite direction, press firmly on the left side fold, but do not press out the original crease. 4. Press again on the right side fold. The creases will become your sewing guide, so you don’t want to press it out. 5. 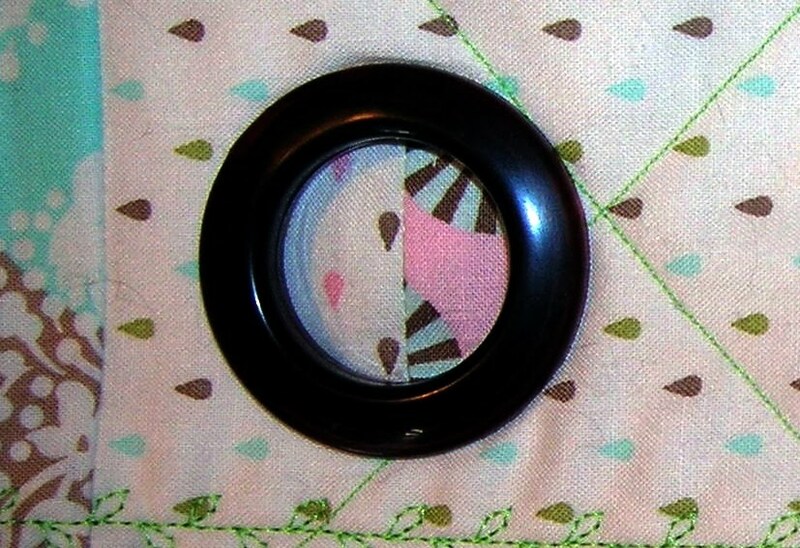 Open the pressed unit, and pin the center to keep the fabric from shifting. 6. 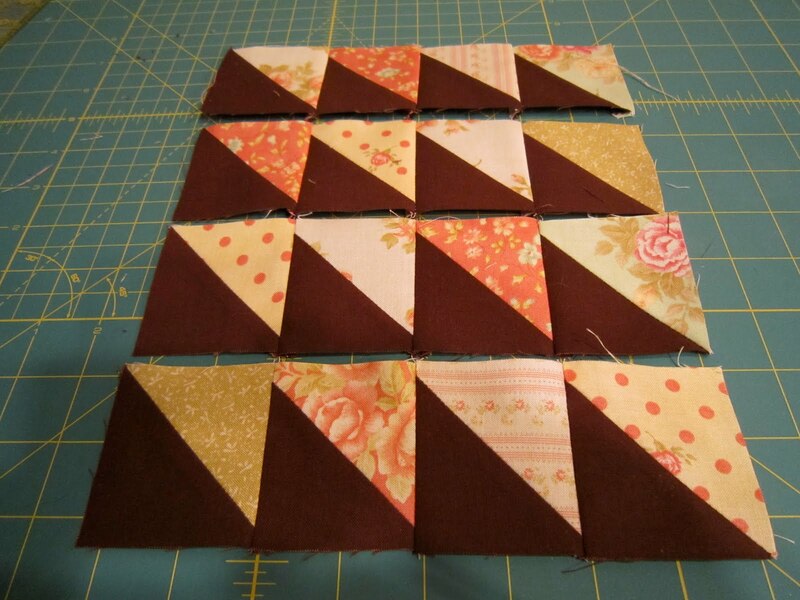 Sew on the diagonal, around the entire charm square unit on all four sides. Marking the lines isn’t necessary – but you can if you would feel more comfortable. 8. Using a ruler and marking tool (thin pencil works well), draw a line 1/4″ from either side of the seam line, on all four units. 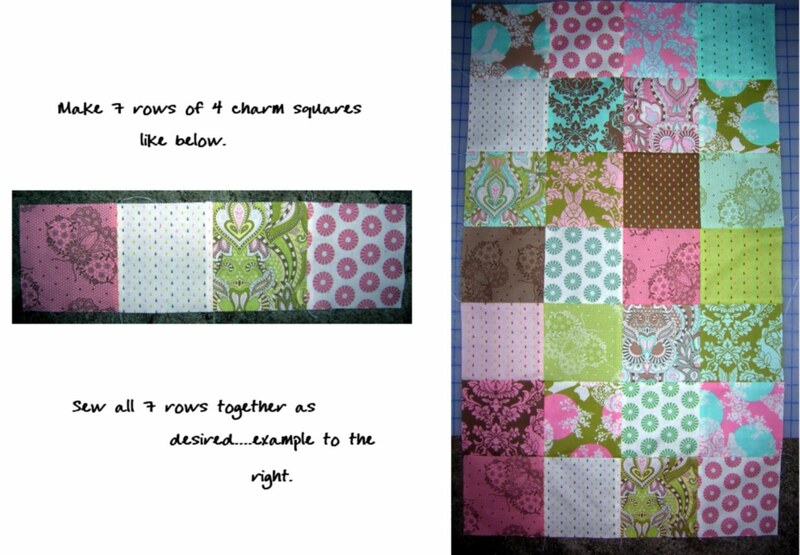 2 Charm Squares (one solid/one print) yield 4 2″ HST finished units, and 4 1 1/4″ HST finished units. What to do with all of the 1 1/4″ HST units? 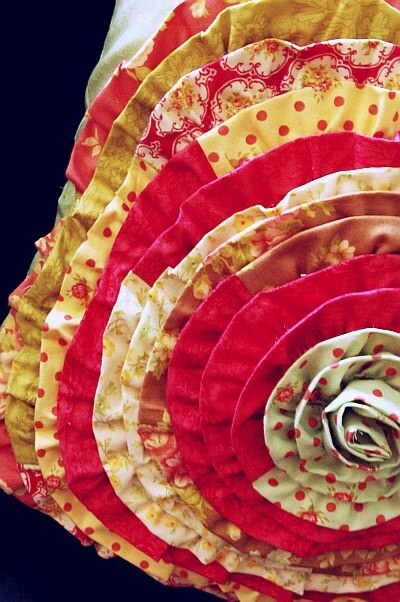 Pinwheels…lots of pinwheels! 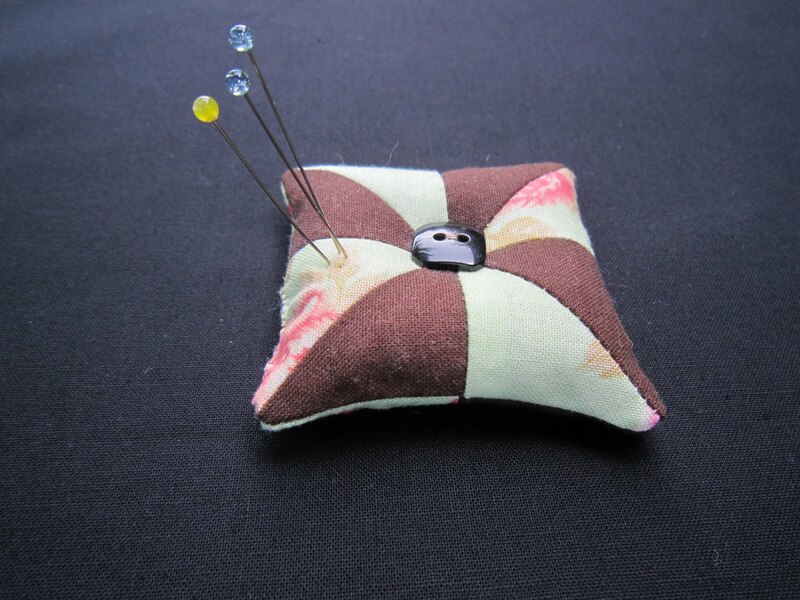 Add a small button to the center, stitching through the entire pincushion. 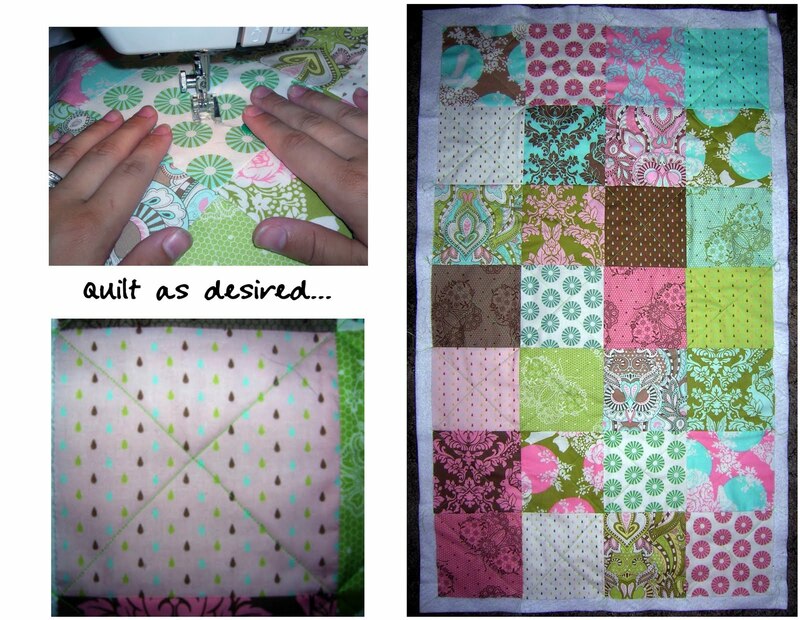 I hope you enjoy this quilt, and this new HST trick! I haven’t tried it on a 10″ Layer Cake, but I’m certain the same method would apply to those as well. Have you heard about the 1 Million Pillowcase Challenge? This challenge intrigued me. 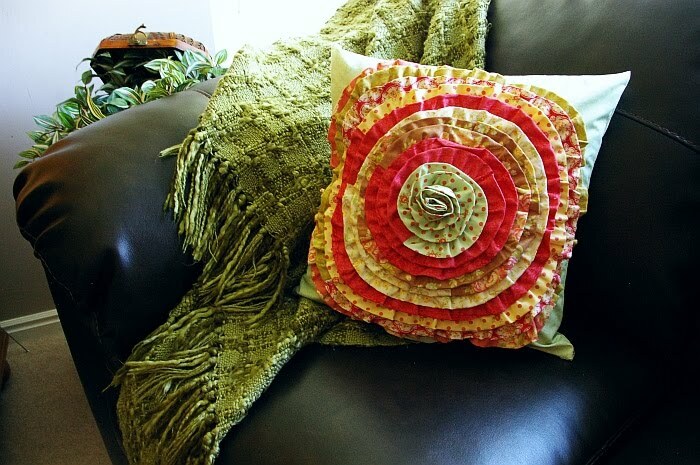 Pillowcases are so easy to make that I wondered if they could really make a difference. Then I made my kids some new pillowcases. I noticed that they loved them! Sometimes they would take them and fill them with toys and drag them around the house. Here’s my contribution to the 1 Million Pillowcase Challenge! Make a pillowcase for yourself or to donate! 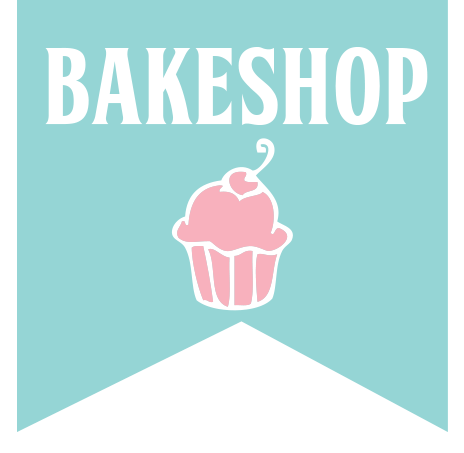 Come visit my blog! 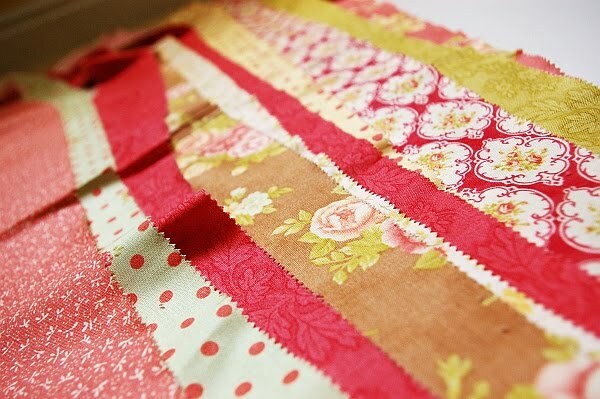 We’re just finishing up a Jelly Roll Sampler Quilt-Along and plans for another quilt- along are in the works. That’s enough to make 4 pillowcases! 1) This step is optional. You only need to do this if you are making 4 pillowcases with your Honey Bun. Take yardage and cut one 1 1/2″ strip off one end. Cut a clean edge from the other end of the yardage. Your yardage should be between 25″ and 27.” The exact size doesn’t matter. Just make sure you have a piece that is nice and square (not square as in all sides even – square as in 90 degree corners). 2) Pick 1 Honey Bun strip or one of the 1 1/2″ strips that were just cut from the yardage to use as the accent trim for the pillowcase. I took this picture and then changed my mind several times. 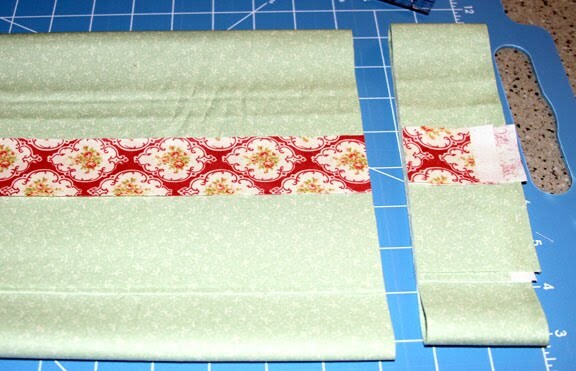 I ended up making two pillowcases with trim and two without trim just for fun. 3) Take all the Honey Bun strips and cut them in half. Now there are 80 strips that are about 1 1/2″ x 20″ long. 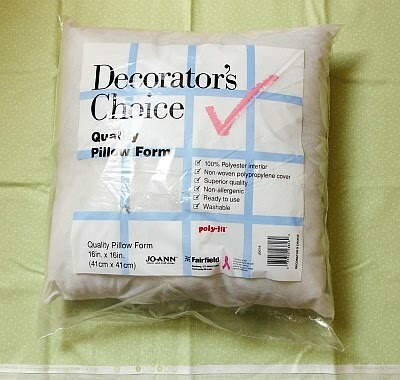 4) Separate these half strips so that each pillowcase has 20 half strips. 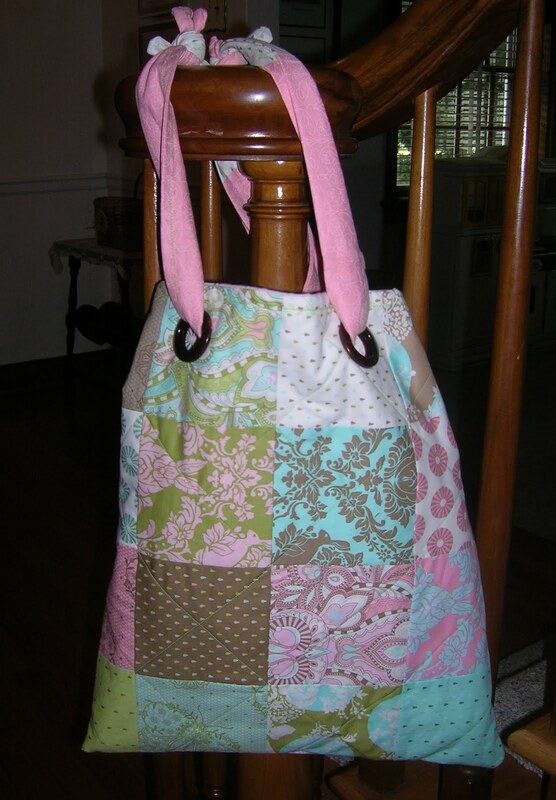 I originally wanted to sew mine randomly together, but I couldn’t do it. 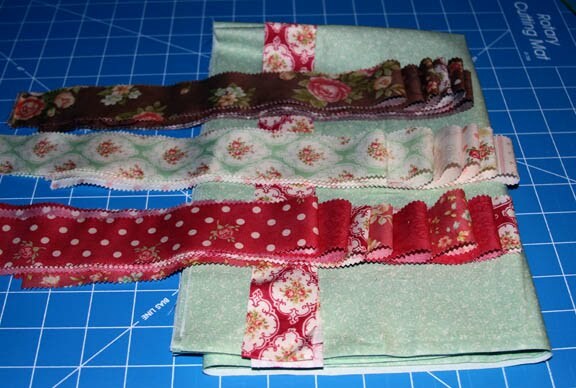 5) Sew the half strips together into 2 sets of 10 strips. Press. 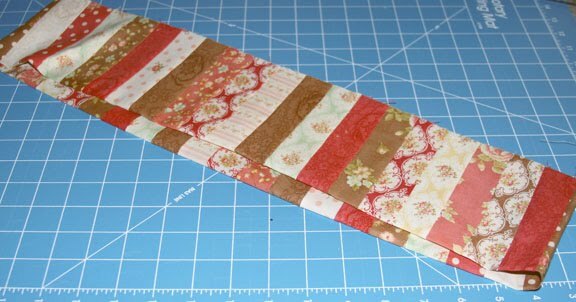 6) Cut each of these strip sets into 2 sets 9″ wide. 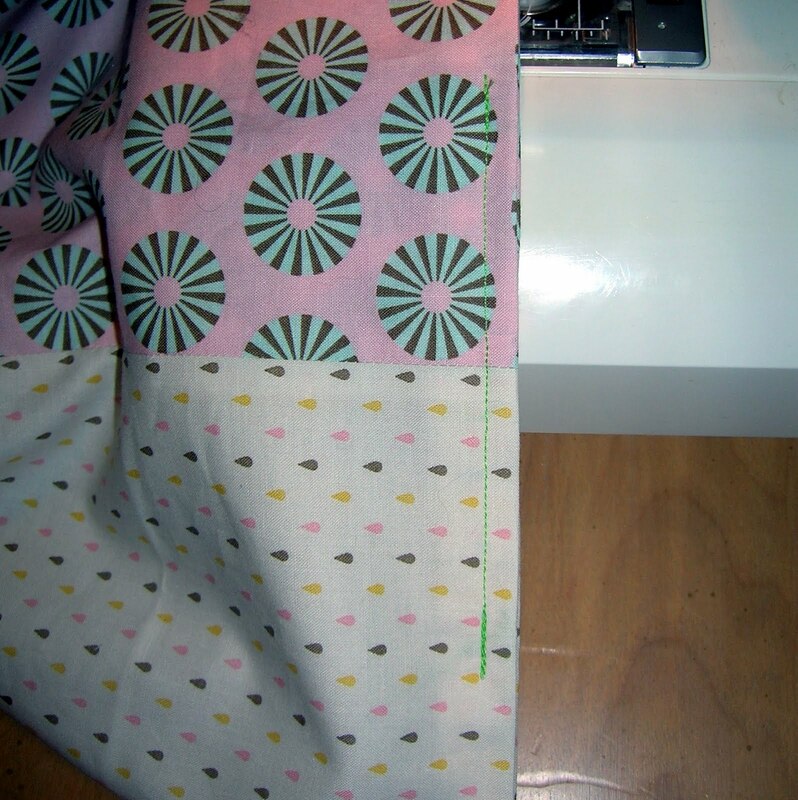 The length of the strip set should technically be 10 1/2.” I found that because of variables in sewing and pressing this many seams that this length varied slightly. I have made allowances for this in the pattern. 9) Here’s where we account for how big your strips end up being. 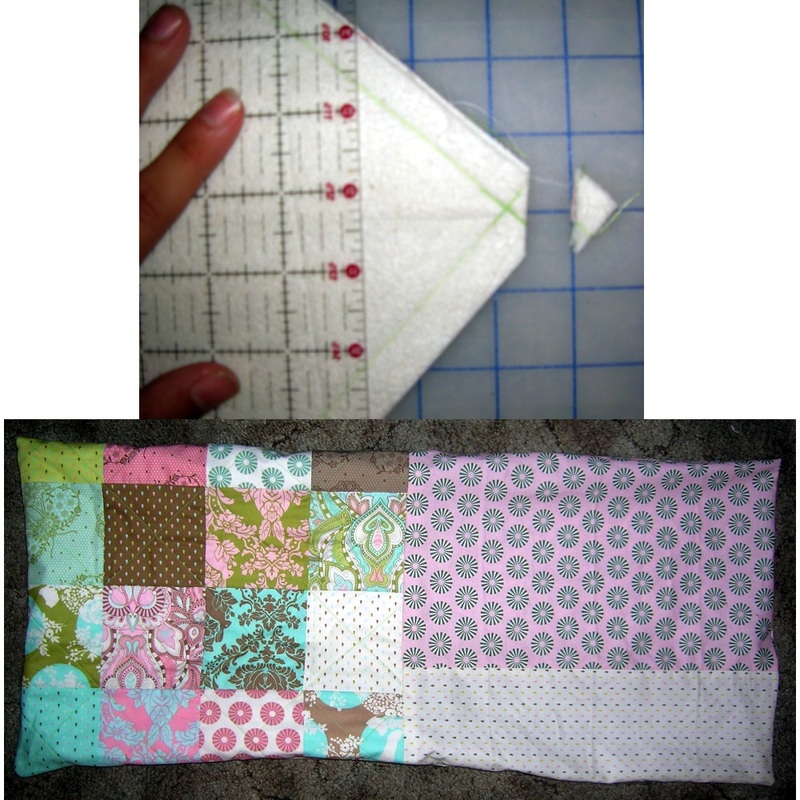 Measure the length of your pillowcase band folded. It should be around 20.” Add 1/2″ for the seam allowance. This is how wide to cut the folded body of your pillowcase. 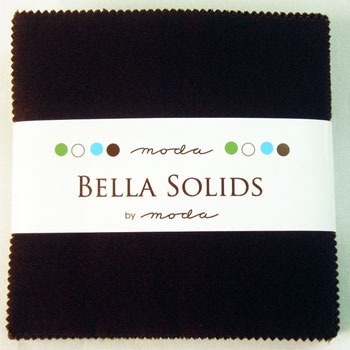 In the picture below, the fold of your yardage and accent strip are on the left out of the picture. Measure from the fold and cut 20 1/2″ or what your band measured. 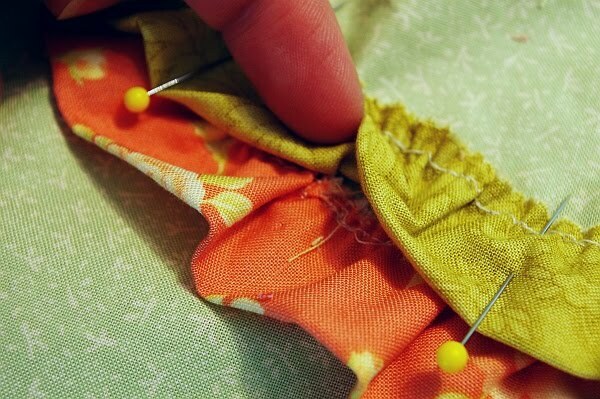 10) Turn your yardage (shown in green) right sides together and sew along two sides. Then sew the same seam again, this time with a zig zag stitch. (A serger would be great instead if you have one.) 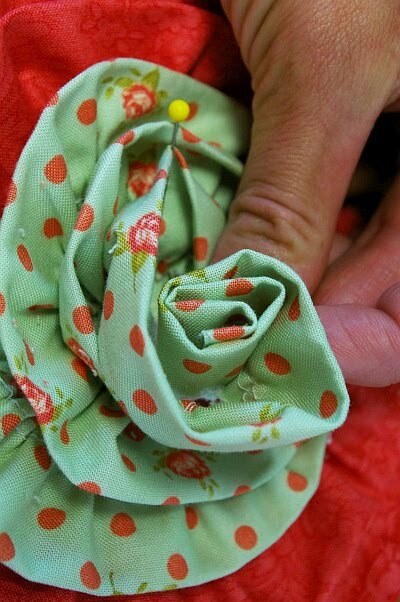 Turn your accent strip (shown in red) right sides together and sew along the narrow edge and zig zag as well. 11) Press the accent strip in half lengthwise with WRONG sides together. 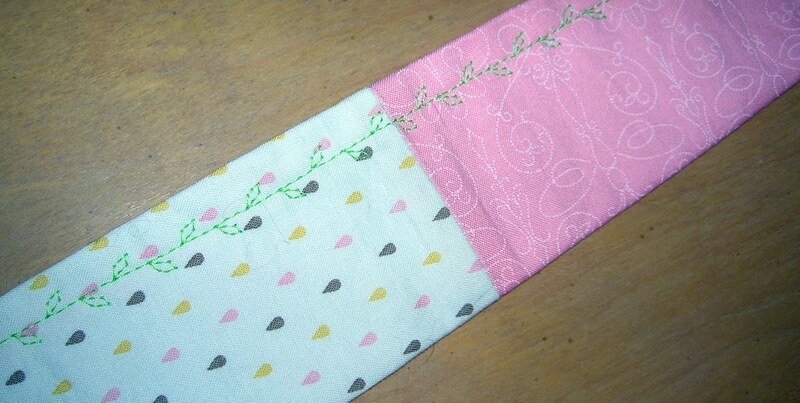 12) Sew the accent strip onto the pillowcase band with a 1/8″ stitch. You are basting the accent onto the band and don’t want the stitching line showing in the finished product. 15) Turn it inside out and find a pillow! 4 Pillowcases — here’s a picture of the bands. 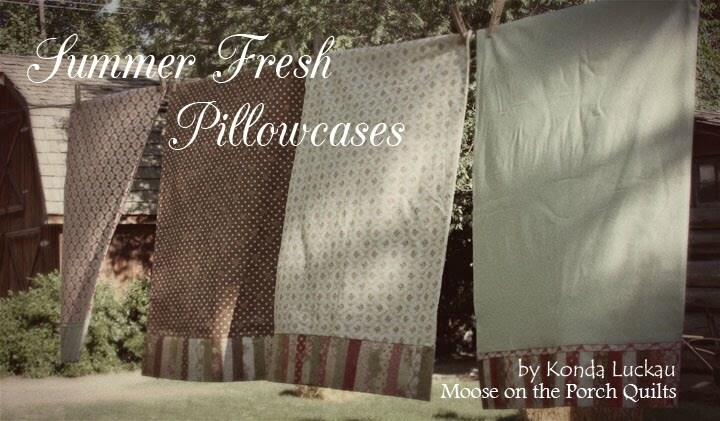 These pillowcases are quick enough that you can finish them in the few dog days of summer that are left! 1. 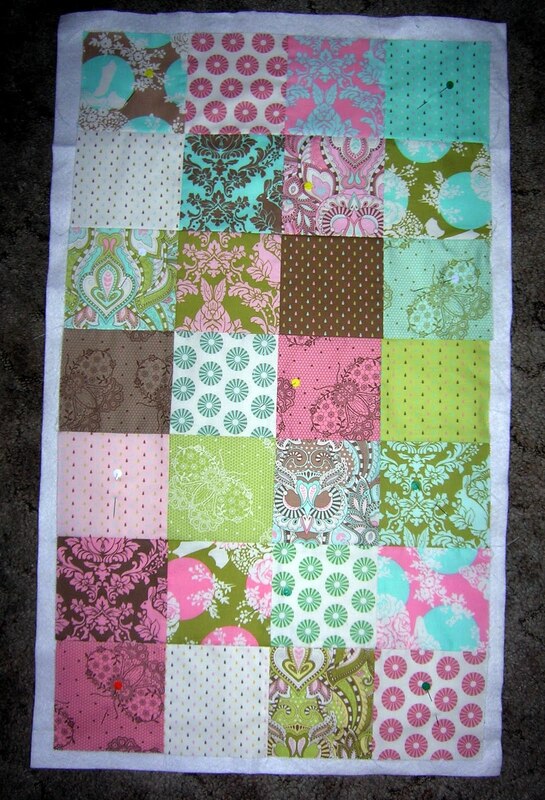 Sew 7 rows of 4 charm squares. Press rows in opposite directions. 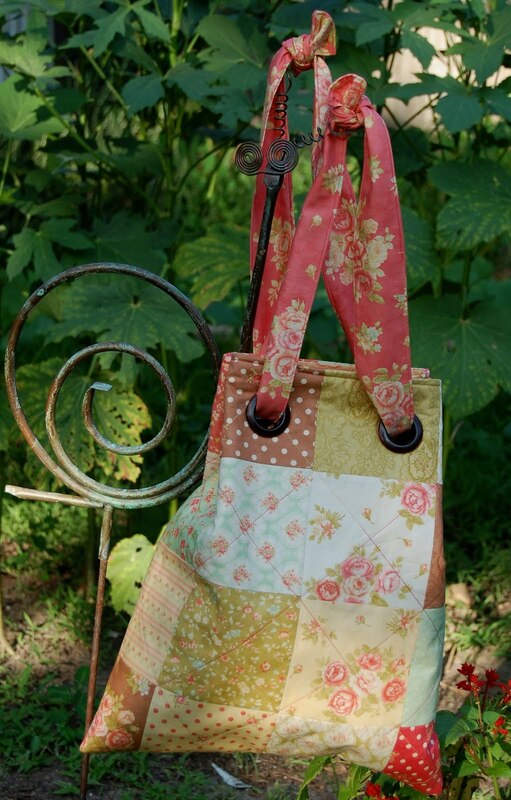 Sew rows together as desired to create outer bag unit. 2. Place batting down and put pieced outer bag unit (wrong side down) on batting. 3. Quilt as desired. Trim to 18” x 31 1/2”. 4. 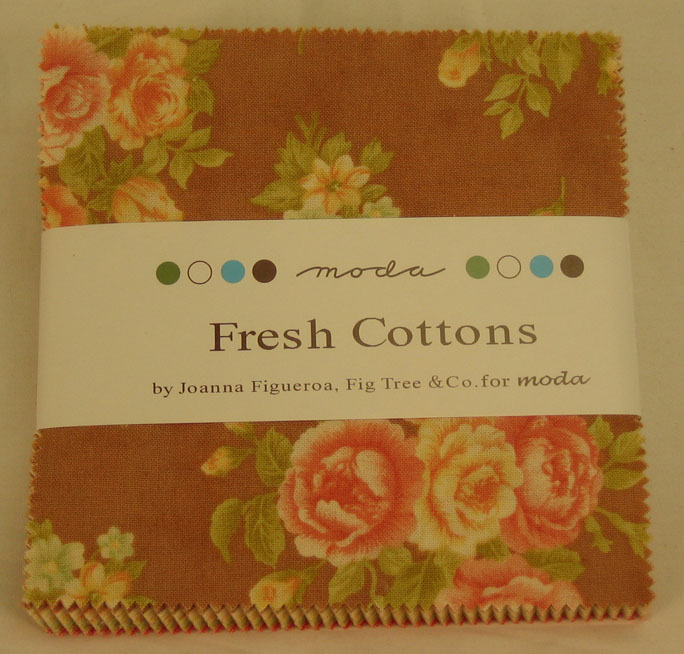 From lining fabric, cut (1) 18” x 31 1/2″ rectangle. 5. With right sides together match one of the 31 1/2” sides of the lining and quilted rectangles. 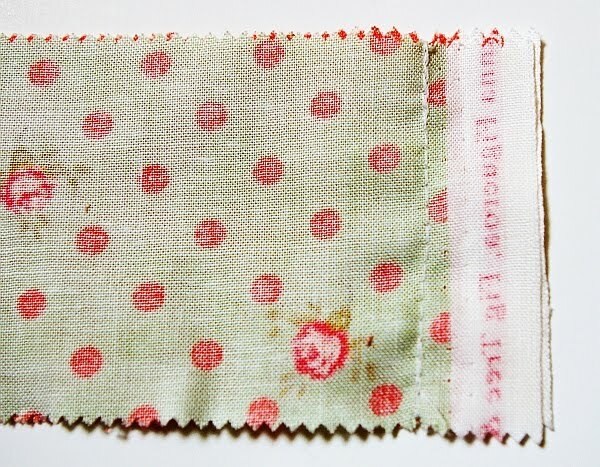 Sew using a ½” seam allowance. 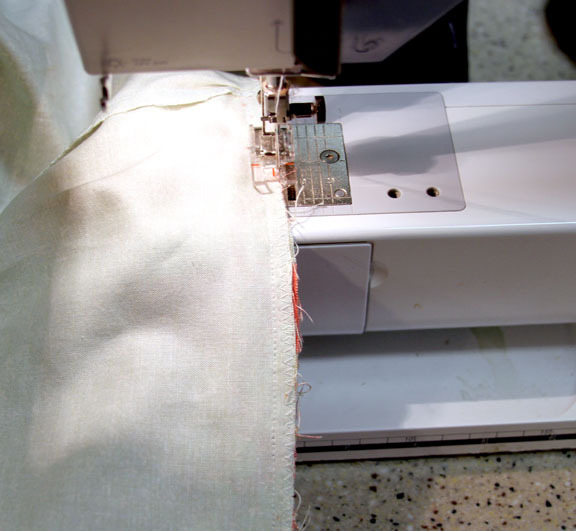 Press seam toward lining. 6. Fold lengthwise in half as shown. Pin all 3 sides. 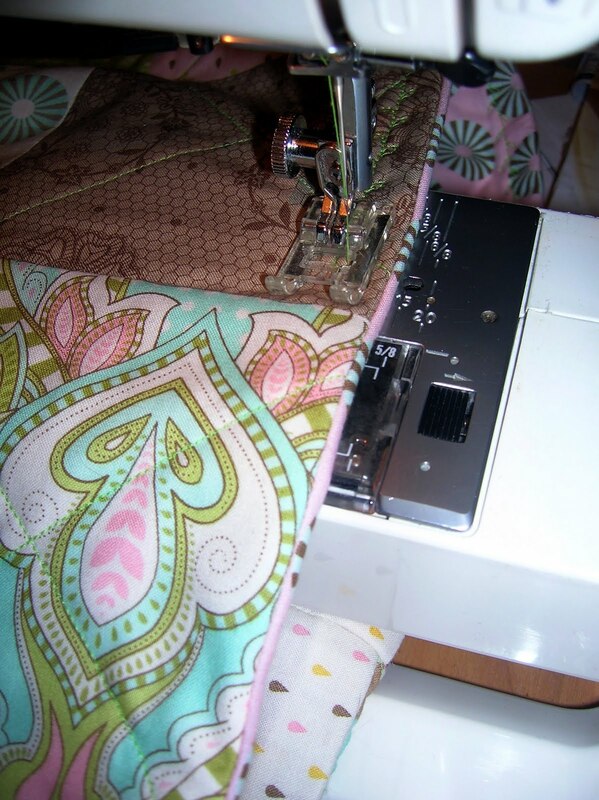 Using a ½” seam allowance, sew all 3 sides leaving about 4” of the lining section unsewn for turning. 7. Trim corners being careful not to cut through stitching. Turn right side out through 4” opening in lining and poke out corners. 8. Stitch the lining opening closed. Push the lining into the quilted section of bag. 9. 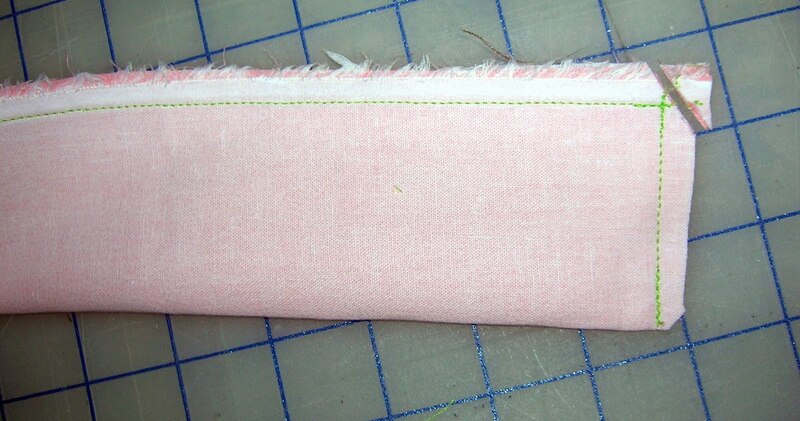 Press the top edge of bag and topstitch ⅛”and ¼” from the top edge of bag. 1. On left side of bag, mark 2” down from top edge of bag and 1 ¼” from side of bag. Then mark 3 ½” from 1 ¼” mark. Repeat marks for right side of bag. 2. Repeat step 1 for other side of bag. You will now have 8 grommet placement marks. 3. Position the template provided with the grommets over the center marks and trace in the slots. Cut out the holes for each grommet on the traced lines. 4. 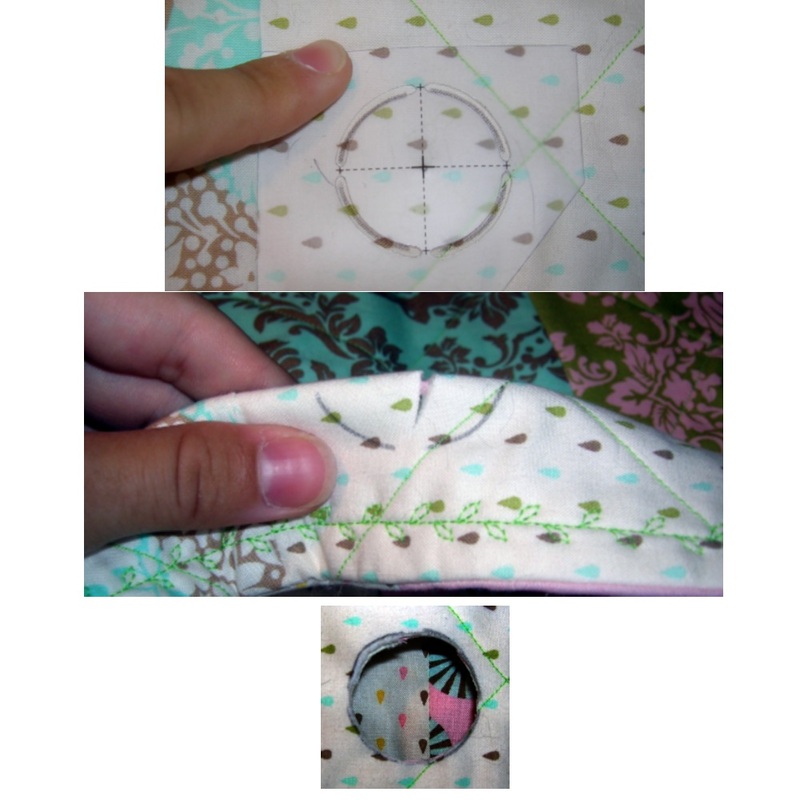 Place the raised center of a grommet in each hole from the right side. 5. Position the pronged side of each grommet over each raised grommet and press down to secure. 1. Fuse the woven interfacing to each strap strip. 2. Fold strap long side in half RST. Stitch using a ¼” seam allowance starting at short end, leaving about 4” opening for turning (along long side) and ending at shut end. Clip short end corners and turn right side out. 3. Top stitch all the way around strap being sure to close opening. 4. Thread one strap through the 4 grommet holes on one side of the bag. Repeat for the other side. 5. Tie ends of the two straps together. 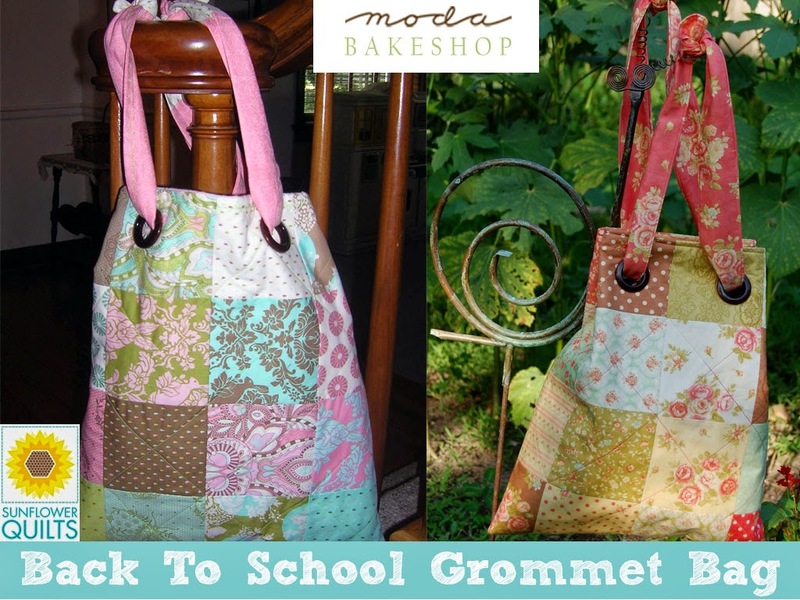 Hey ya’ll I hope you like our Grommet Bag….they are addicting and super easy to make! * 2 Charm Packs will make 3 bags! 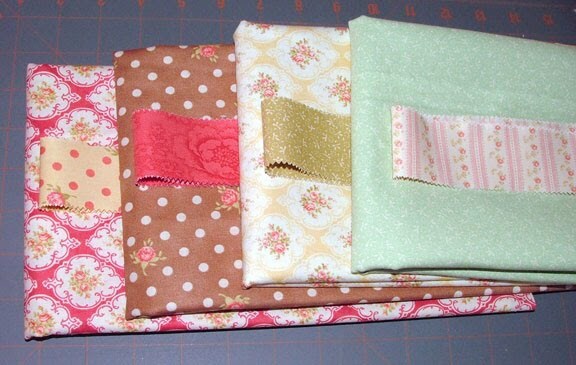 * You can always add pockets to the insde with left over charm squares!! * These make great gifts!